Valiant says the biggest news they've ever had will come out in this year's Comic Con', and Marvel must be feeling the same way, as they have already started with the heavy hitter announcements that would usually be saved for the big event. 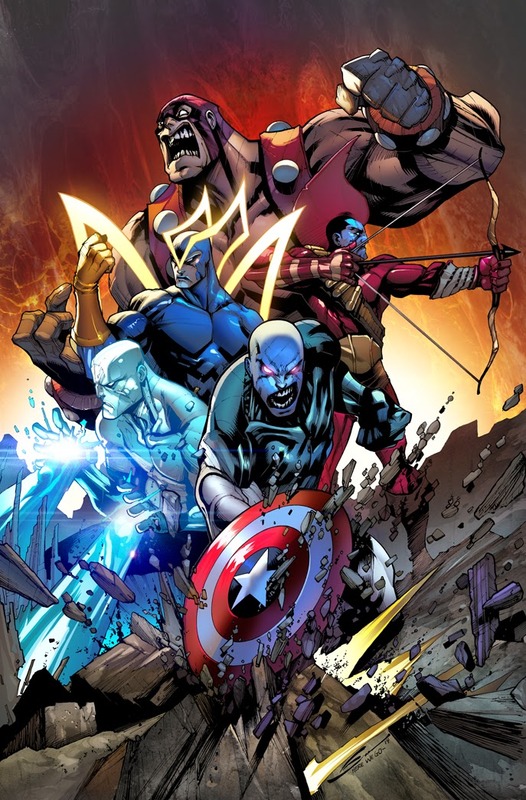 Unleashing today the awesomeness of awesome that Guardians 3000 will launch in October, written by Guardians of The Galaxy iconic writer, Dan Abnett, drawn by up and coming icon Gerardo Sandoval (his blog is here), and featuring the original iconic Guardians team. Another sweet, sweet release on the backs of recent newsmakers, Spider-Man 2099 and Elektra, this book looks set to steal the show as the Guardians live-action movie roars into theatres. Future 'Justice' Vance Astro, Yondu, my fav Starhawk, Martinex and Charlie-27 rip back on a new mission to battle the Badoon. Set in the 31st Century, the series promises familiar and new faces, a new timestream threat to reality and an obligatory mysterious 'key to times salvation' in young lassie Geena Drake! "Guardians 3000 is truly a case of you asked for it, we delivered!," says Marvel editor Mike Marts. And he is 110% iconically right. gggrrr...never mind the Guardians...unlike the rest of us comic readers, no one outside the comics world had even heard of them before all the hype over the movie...the only 30th/40tury heroes I want to see back are the Legion of Super Heroes! I wonder if Legion needs a 3000 in the title Karl. DC's obviously hsving trouble with the series, and as a marketing dude by trade, I thknk a small part of the problem is that the covers don't herald the fact the book is set in the future. Verbally or visually. A 'the 31st century's greatest comic magazine' could really help. I'm really starting to think we are comic twins separated at birth King. All the logic points that way.